Very often when I'm brought in on a project, I can use my Driver personality to full effect because the project is already perceived as a raging inferno and needs a dramatic and rapid change. That can come off as harsh and people sometimes compare me to a Drill Sergeant (even though I've never actually been one). In some environments that approach is appropriate, upper management appreciates a firm hand, and the team responds because they now have a solid direction and guidance. However, that may not always be the best approach. If the organization doesn't perceive the project as an inferno, or the attitude is "this was a trial run to see if it will work" then a firm hand and extreme Driver tendencies can turn off your team, make management regret bringing you in, and you will wonder what you were doing wrong. In fact, at one time I was involved in a project which was just like that. The project had about 3-4 months until Go-Live, had been struggling for 3 years, but the organization didn't perceive the project as an inferno. It was a trial balloon which had floated for long enough and they wanted to see some results from their investment. They wanted to try to instill some direction and drive into a project they felt was floundering but still viable. This calls for a different approach. 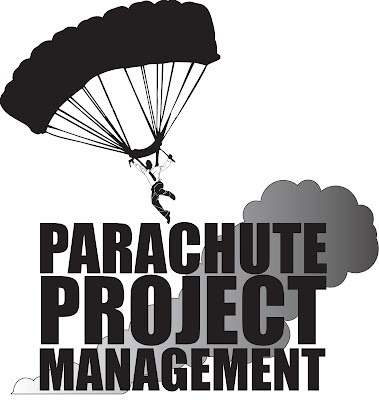 It's still Parachute Project Management; however, instead of jumping into a project which is an inferno, you are jumping into a project which is smoldering. Your actions if not properly monitored and moderated could take those embers and make them an inferno if you aren't careful. 1. What is the attitude of the team? Are they panicked? Are they harried? Are they acting resigned to the fate of the project? If they are panicked and harried then you are probably looking at an inferno, resigned is smoldering embers. 2. What is upper management's attitude? What was their intent on bringing you into the project? Are they looking for a turn-around or more guidance for the project team? 3. What are the stakeholders' attitude? Do they care if the project is delivered? Are they excited, concerned, or lack any emotion related to the project? Excited and concerned are good things, a lack of emotion indicates that they aren't paying attention, and often they won't care until the project is actually burning right on top of them. I hope with these questions you can see where I am going with this. Parachute Project Management is all about project recovery and turnaround, and while the steps required to do that are consistent regardless of environment, how you implement those steps needs to be adjusted depending on that environment. I look forward to meeting some of you at the PMI Nashville meeting next week!